Who doesn’t love meatballs? Asian, Italian, Italian/American, Mexican or Swedish. Beef, chicken, lamb, pork, tofu or turkey. Large, small, baked, braised, fried or steamed, every culinary culture has a version & just about everybody enjoys meatballs. Historians trace their origins to 207 BC mainland China. We’re celebrating National Meatball month with a recipe from the talented home chef & our friend Laurel. The recipe is from The Crepes of Wrath & not just for spaghetti. Laurel used Villa Gabriella Organic, 8 year aged balsamic vinegar di Modena for a moist & flavorful meatball. 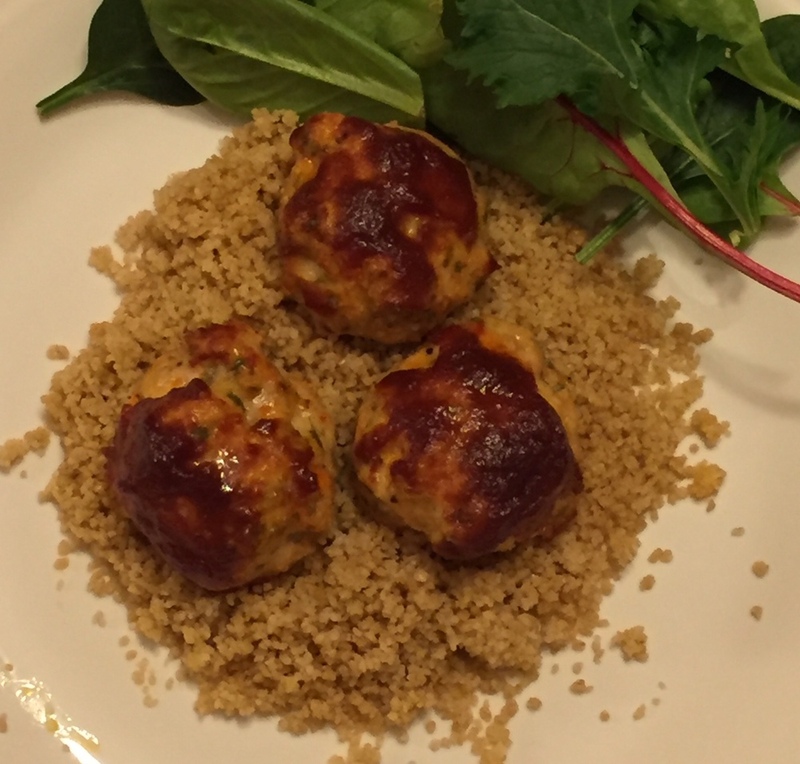 Served with couscous & a mixed green salad for a healthy & delicious week night dinner. Extras went into a tasty sandwich with Laurel’s homemade ricotta. Makes 15 meatballs. In a large bowl, whisk together the egg, parsley, tomato paste, garlic, milk, salt & pepper, making sure the tomato paste is completely dissolved. Add the ground chicken, cheese & breadcrumbs. Using clean hands, mix ingredients together to form medium size balls (approx. 2-3 tablespoons round), you can also use a small ice cream scooper. Place meatballs onto a foil or parchment lined and/or greased baking sheet. Brush the glaze over meatballs (a soup or table spoon works too). Bake approx. 30-35 minutes, or until an instant read thermometer inserted into the center of a meatball registers 160 degrees. You can also test the meatballs with a fork. Serve & enjoy using extra balsamic on a small plate for dipping. HOW DID THIS RECIPE GO? DID YOU ADD ANOTHER INGREDIENT TO MAKE IT EVEN BETTER? PLEASE SHARE YOUR COMMENTS & FEEDBACK WITH US! WE WANT YOU TO HAVE A HEALTHY & DELICIOUS EXPERIENCE WITH OUR PRODUCTS!